Awesome. Really. Could you post more photos? From above to show the blade profile. Hieno puukko. Tuota kelpaisi heilutella korvessa. Ei tarttisi selitellä. 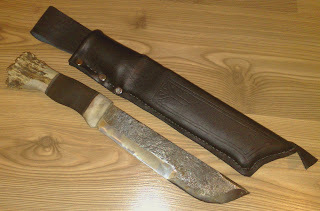 Good, practical knife and sheath! Congratulations! Well..the spine would be the only obvious part showing the variable thickness of the blade as it shows clearly how its thinner at the beginning and gets thicker towards the tip,its at its fattest at about 5 centimeters before the tip,and then it turns into thin again. The fattest part is also the "highest part" of blade,so theres the greatest amount of mass,just above the chopping edge which is very "dull" convex ground,so its splits better and lasts longer. Yep, do know the "axe & woodclone" thing i think :). Its as there isnt any other choises...but there is. My friends and few relatives wh are sami reindeer men, usually carry just one mid sized or large leuku,and thats it,sometimes there is some smaller puukko too but usually its just a sturdy leuku that has been modified into two-bevel style as mine is too. I like it! The blade looks strong and versatile and the handle looks like it would be comfortable to hold. Great job on the sheath, as well. It looks very rugged. Nice leuku! Looks very usefull and seems that the weight balance is just right. Leuku is especially usefull in Lapland, one reason is that the common wood you have to cut is quite thin birch, no need to saw it or cut it with an axe. Did you say crude? I'd say good looking, solid, practical, interesting, hand made, character, indivuduality... And better, not another Woodlore clone...Yay! How big is it? and what did you to the cutting edges? convex in one part and scandi on another? It's hard to tell from the one picture. the first edge next to handle os scandi/hollow with tiny secondary and the next part is convex,and then the tip has some about one and a half inches of scandi again. Esko, I do miss lappland too,its way better area for my peace of mind. I like the "crude" (lol) finish a lot, it adds character to the blade, and it is forged very cleanly, you are a skilled blacksmith. The concept is great, and it gets me thinking. I like the leuku form myself, for it makes for a very versatile blade. But then I like quite a lot of styles a lot;-), so I will have to build one to test...;-). The sheath looks unusual, but very matter-of - fact. Nice!